Wellington, FL – January 10, 2013 – Brazil’s Rodrigo Pessoa and HH Let’s Fly galloped to victory in the $30,000 Ruby et Violette WEF Challenge Cup Round 1 on the second day of competition at the 2013 FTI Consulting Winter Equestrian Festival (FTI WEF) on Thursday. After kicking the year off with a second place finish in last weekend’s inaugural $100,000 Trump Invitational Grand Prix, the duo is off to the races with a win to start their winter circuit. Week one of FTI WEF runs January 9-13, sponsored by The Mar-a-Lago Club. The week will feature a full schedule of exciting hunter/jumper competition, including the $55,000 Nespresso Battle of the Sexes exhibition class as the start of the “Saturday Night Lights” series and fun events like the Jump for HomeSafe fundraiser. Highlights of week one include the $25,000 Suncast 1.50M Championship Jumper Classic on Saturday afternoon and the $30,000 Mar-a-Lago Club Grand Prix on Sunday. The 2013 FTI WEF runs through March 31 featuring 12 weeks of world-class competition. Eric Hasbrouck is the course designer in the International Arena at the Palm Beach International Equestrian Center this week and set the track for Thursday’s $30,000 Ruby et Violette WEF Challenge Cup Round 1. Thirty-eight entries contested the class for the first round of competition and nine jumped clear to advance to the jump-off. A tight time allowed kept five others without jumping faults out of the tie breaker. Seven of the nine jump-off entries cleared the second round course without fault, but it was the trailblazing time of Rodrigo Pessoa and Double H Farm’s HH Let’s Fly that set the pace and held on through the end. Pessoa and the 14-year-old Hanoverian gelding by Lordanos x Forrest galloped through the timers in 35.940 seconds, first to go in the jump-off, and no one else would come close. Peter Wyle (USA) and The Wannahave Group’s Sandor De La Pomme finished second with their time of 36.392 seconds. Third went to Shane Sweetnam (IRL) aboard Spy Coast Farm, LLC’s Siri with a time of 36.591 seconds. Luis Larrazabal (VEN) and Anabel Simon’s G&C Sacramento placed fourth with their time of 36.664 seconds. Following their round of honor, Rodrigo Pessoa remarked on a successful day with Let’s Fly. 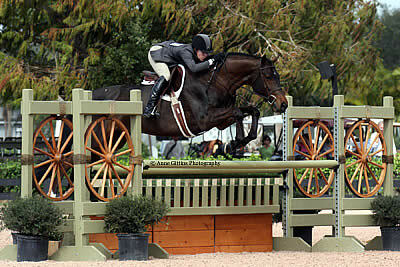 Coming up, Let’s Fly will show in Sunday’s $30,000 Mar-A-Lago Club Grand Prix and will then have a week or two off. Pessoa then hopes to gear him towards the Challenge Cup classes and one or two more grand prix during the circuit. As for Pessoa’s other plans, he has two top grand prix horses to show and a few other young ones. Along with riding horses for G&C Farm, Pessoa is also coaching their riders and had the added bonus of helping Luis Larrazabal jump to a fourth place finish in today’s class. He was pleased with that outcome as well. Along with his prize money and cooler, Pessoa was awarded a $3,000 rider bonus for the SSG “Go Clean for the Green” contest. The bonus is awarded to the winning rider if they are wearing the SSG ‘Digital’ Riding Gloves in all rounds of competition with the SSG logo clearly visible. It was Pessoa’s first time winning the bonus. Quotable and Holly Orlando jumped their way to championship honors in the Sanctuary Green Conformation Hunters during the opening week of the FTI Consulting Winter Equestrian Festival (FTI WEF). The seven-year-old Dutch Warmblood gelding, owned by David Glefke and Dr. and Mrs. Kenneth Garber, handily won the division after strong performances during both days of the division’s competition. Quotable and Orlando won the model and placed first and third over fences on day one. They clinched the championship after placing first and second in today’s over fences classes. Reserve honors went to Ainsley Sadlo’s Balin, ridden by Havens Schatt. Schatt and Balin placed second and third in yesterday’s over fences classes. They went on to win the Hunter Stakes round during today’s competition and pinned third in today’s second over fences class. Glefke and Garber only purchased Quotable in November, but he has quickly proven himself to be an exceptional horse. Orlando rode him to a Pre-Green championship title in their first show together, and the decision was made to move him up to Green Conformation right away. Last week, in his first week of Green Conformation competition, Quotable was named reserve champion. “He needs a bigger jump. We just did [Pre-Green] to get to know him one time. To do another year of Pre-Green would be boring for him,” Orlando explained. Today’s victory marks only the third time Orlando has shown Quotable, but clearly the pair is a winning combination. “He’s been so amazing. He’s a perfect ride for me. He’s really light and soft with a big stride. He’s a great horse,” Orlando stated. Glefke, who owns last year’s FTI WEF Green Conformation Circuit Champion, Voice of Reason, has been raking in prizes with his green horses during week one of competition. On the Hour was Second Year Green Champion and Charmed Life earned top honors as the Pre-Green 3 & 4 Year Olds Champion. Both horses were also ridden by Holly Orlando, who started riding for Glefke at Lane Change Farm in the fall. The opening week of competition at the FTI WEF will continue tomorrow with a full schedule of hunter and jumper competition. The E. R. Mische Arena will host this week’s final classes for the Adult Amateur Hunters 36-50 before awarding championship honors. 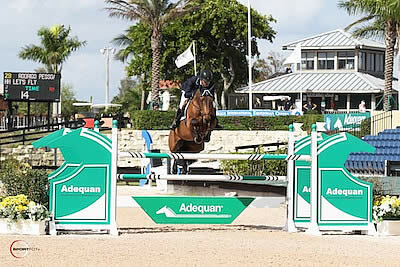 Day three of the 2013 FTI Consulting Winter Equestrian Festival will continue in the International Arena on Friday featuring the Adequan Seven-Year-Old Young Jumpers. In the hunter divisions, championship honors for the Adult Amateur 36-50 Section A will be highlighted. For full results, please visit www.showgroundslive.com.